Sonic Boom is an American and French 3D animation series created by OuiDo! Productions, which first aired on Cartoon Network on November 8th, 2014 in the United States, and on Canal J on November 19 in France. Sonic Boom features Sonic the Hedgehog, Miles "Tails" Prower, Knuckles, Amy Rose and the show's new character Sticks the Badger on a never-ending search for adventure and their battles with their arch nemesis Dr. Eggman, with other characters, both new and old, also joining the ensemble. The show takes a comedy approach similar to Adventures of Sonic the Hedgehog (not as wacky as AoStH though). It is meant to be a show unrelated to the main Sonic video games, making it non-canon. There were three games based upon the TV show, Sonic Boom: Rise of Lyric for the Wii U, and Sonic Boom: Shattered Crystal and Sonic Boom: Fire & Ice for the Nintendo 3DS. The show started with positive feedback, however the later episodes gained mixed feedback from fans. Regardless, it is often considered the best thing in the Sonic Boom franchise by fans, and has received a few awards and nomnations, one of such being an award for Best Animation at the 2017 Chico Independent Film Festival, a nomination for a "Teen Choice" award for animated TV shows on June 20, 2017 (but lost to Family Guy) and an award for Best Series from Filmchilla on August 27, 2017. 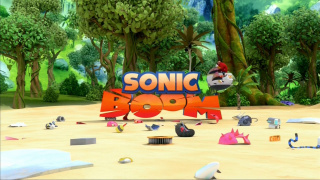 Sonic Boom was then renewed for a second season now produced by Technicolor Animation Productions, starting its run on Boomerang on October 29, 2016 with the season finale airing on November 11, 2017. The second season is considered to be superior to the first season by fans. On December 17, 2016, storyboard artist Clemence Liberge stated on Facebook that there will be a third season, but this has yet to be officially confirmed. Pages in category "Sonic Boom (TV series)"
This page was last edited on 12 March 2018, at 23:21.